After weeks of negotiations, the deal that will create Israel's 33rd government is finished – except for one small detail: Sarah Netanyahu, the Prime Minister's wife, has still not reconciled herself to the fact that Naftali Bennett will be a member of Binyamin Netanyahu's government. According to sources in the Likud as reported by Army Radio, she prevailed upon her husband to backtrack on several understandings the negotiating teams for Bayit Yehudi and Likud/Yisrael Beiteinu had attained. As a result, the negotiating team for Bayit Yehudi that was supposed to close up the deal with the Prime Minister, in preparation for a signing ceremony Thursday night, had still not arrived for talks by Thursday afternoon, indicating a mini-crisis in the deal. Israel Radio speculated that the tardiness of the Bayit Yehudi team was intentional, in protest over the changes Sarah Netanyahu is demanding in the coalition agreement. 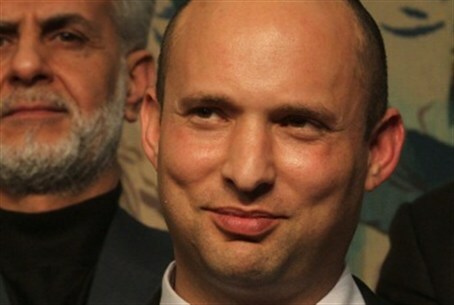 According to Israel Radio, Netanyahu is seeking to remove some responsibilities from the two deputy minister posts that Bayit Yehudi will hold in the government. The reason for the bad blood between Sarah Netanyahu and Naftali Bennett is unclear, but does go back to the period when Bennett was the director of Binyamin Netanyahu's office when he was Prime Minister over a decade ago. On Thursday, the Likud met to discuss the coalition agreement. Party officials said that the government would propose Yisrael Beiteinu's Yuli Edelstein for the position of Speaker of the Knesset, as Reuven Rivlin decided not to contend for a second term at the post.